This small fee add-on to GAB allows your advertisers to see their stats. You need to FTP the gab_stats.php file into your main forum directory. This is the same directory that contains the vBulletin showthread.php file. Go to the ACP -> GAB -> Banners and there you can add a new banner or edit an existing banner. In the userid box, enter the vBulletin userid for the member/advertiser of the banner. To find the vBulletin userid of a member, go to the ACP -> Users -> Search for Users and there you can search on user name. When you find the member, near the top of the page will be the following: User: User name here (id: userid here). You can also find the userid by going to the profile page for the member. Example: http://www.thevbgeek.com/member.php?u=1533 (the number is the userid). If the person is not a member of your forums, you will need to add the member to your forums by going to the ACP -> Users -> Add New User. There you can enter a user name, password, and email address for the new member. Your advertiser will need his user name and password to see his stats. 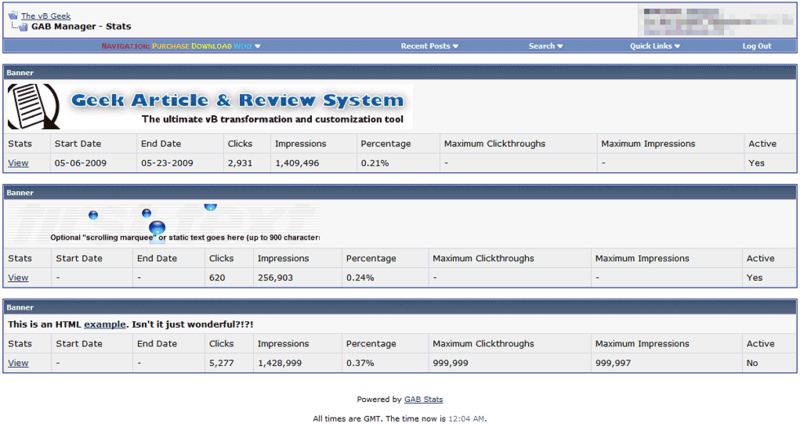 Your advertiser would then go to the gab_stats.php file located in your main forum directory to view stats. 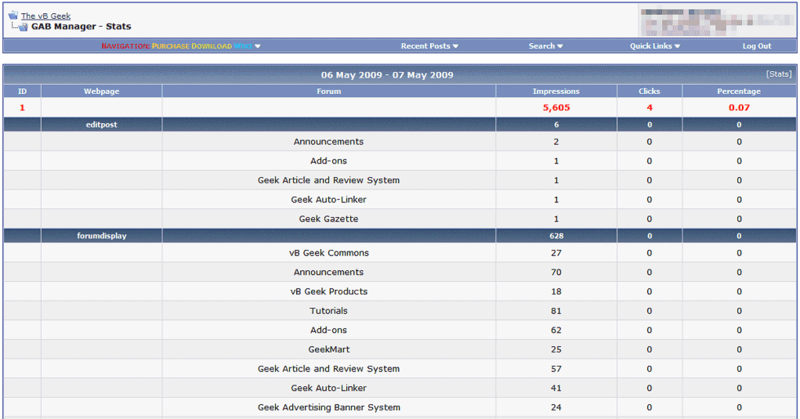 Example: http://www.thevbgeek.com/gab_stats.php (as you don't have any banners on this site, you won't see much on that page, so please check the screenshots below for what it looks like to your advertisers). Below are a couple of screenshots of what your advertiser would see. You can order the GAB stats for advertisers add-on here. If this was default, I might have updated my package with GAB but since this is just an add-on I might give it a complete miss now. very effective, gret tip ! to make new one with the code that you add, but still, dont work. Afraid of implementing this. If there is an issue, I don't want to wait another year or two for a fix or whenever you get around to it. I've been so pissed off about the GAB purchase I made 2x. I bought a one time deal product without updates because the coder was too busy making more one time products. Blah! Where is the file gab_stats.php ? If I have to buy it? How much and how can I buy it? Last edited by vnjporg; 08-22-2009 at 05:55 AM..